MIklasz wrote about the tribute, and what it means, here. Very touching. Many media members stopping by to look at Bryan Burwell tribute here in press box, say a prayer, and take picture. Everyone at the Post-Dispatch would like I thank our friend Tony Wyllie (Redskins VP) for their show of love for our dear Burwell. 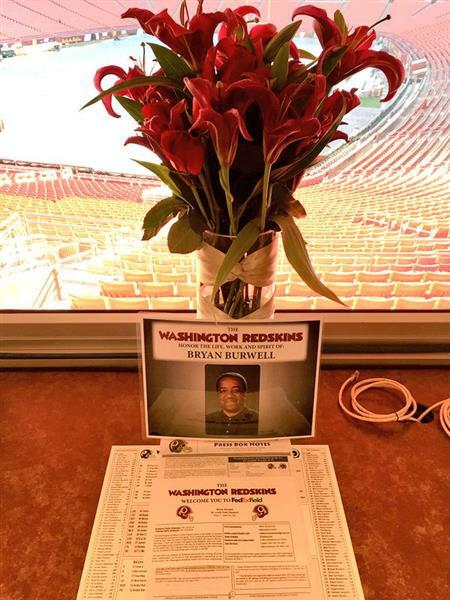 Classy move by Redskins to leave seat empty today in press box to honor Bryan Burwell. He'd have loved covering this game. 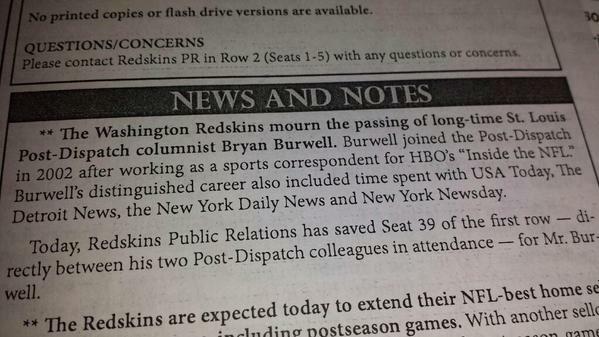 There will be a moment of silence prior to kick and a seat left open in the Redskins press box Sunday for the late Bryan Burwell. Bryan Burwell tackled the subject of the Washington, D.C., team's name an Upon Further Review video.